Fantastic work cairnswk. I love the map. Another beauty. And no gimmicks !! 1) The color bars where the bonus region names are along the left side - could you extend the right side of those bars so they fall underneath the bolder legend border? I also see something between those color bars bleeding through - not sure what it is though. 2) The water routes are a little confusing. since they are so close and all lead to opera house, they get jumbled up around there. What about lines instead of dots - like beveled/flowing lines? 3) I like the traffic lights. Keep them. But I think the road crossings could be a little better than current. Maybe make them slanted instead of horizontal? 4) Your territory font is perfect. What did you use anyway? I love it. Perfect size, perfect amount of drop shadow - well done. 5) Colors are perfect as well. Re: Sydney Metro V3 (P4) [I] - Comments? I agree with everything RJ says except I think the terr names could use the slightest bit of transparency. Also the Olympic Park is missing a drop shadow. u cant see the upper left corner of the 'H' in opera house cause the stop sign is on it, could u modify that so that u can? 1) the Balmoral/Taronga Zoo border runs over the 2nd A in Taronga. 2) I agree with RjB's note about the color bars for the legend - there seems to be uneven spacing between them, and some sort of white vertical stripe shows through on the right side of the bars. 3) Ryde's legend bar doesn't seem to merge well with the brown border. 5) it seems odd that the legend has a brown border around the outside of it, while the rest of the actual map doesn't have any border at all. I'd say keep the brown line as a separator, but remove it from the outside border. That'll give you a few more pixels for the actual map. 7) Maybe take the extra few pixels from #5 and stretch the Opera House/Centennial Park area to give yourself a smidge of breathing room there. FreeMan10 wrote: 5) it seems odd that the legend has a brown border around the outside of it, while the rest of the actual map doesn't have any border at all. I'd say keep the brown line as a separator, but remove it from the outside border. That'll give you a few more pixels for the actual map. Disagree. I like the way the entire legend area has the brown border. My vote is to keep it. 3. The ferry routes are just a little confusing. I get them, but I can see them becoming a problem to the...*Amen* noobs. 4. Inner West I think should be knocked down to 2 bonuses. With only two ways to get into it, it would be pretty easies to defend. i haven't looked at that yet, but please remind me later....if i forget. Thanks for your comments. RjBeals wrote: 1) The color bars where the bonus region names are along the left side - could you extend the right side of those bars so they fall underneath the bolder legend border? I also see something between those color bars bleeding through - not sure what it is though. gimil wrote: I agree with everything RJ says except I think the terr names could use the slightest bit of transparency. bryguy wrote: u cant see the upper left corner of the 'H' in opera house cause the stop sign is on it, could u modify that so that u can? greenoaks wrote: would Centen-nial fit ? RjBeals wrote: Disagree. I like the way the entire legend area has the brown border. My vote is to keep it. 1. Tert names plaques in legend fixed. Love the update, but I'm not so sure I'm down with totally removing the ferry attack routes. Sure you explain it there, but I think there needs to be a path to follow as well. RjBeals wrote: Love the update, but I'm not so sure I'm down with totally removing the ferry attack routes. Sure you explain it there, but I think there needs to be a path to follow as well. 2008-05-10 09:14:43 - oaktown: what the... how'd you do that? Re: Sydney Metro V16 (P6) [I] - Comments? I am okay with the new map, except 1 thing, can't you make the passable lines of the freeway in the legend just the background of that legend instead of green? meh.. I'm not a fan of either. I prefer NO FERRY ROUTES !! But if gameplay depends on them being there, then I say solid lines. But they are part of original gameplay. onbekende wrote: I am okay with the new map, except 1 thing, can't you make the passable lines of the freeway in the legend just the background of that legend instead of green? Last edited by cairnswk on Wed Apr 16, 2008 3:51 pm, edited 1 time in total. Oaktown is correct about having the routes in the legend, but not in the box. It will sneak up on people and piss them off. The more I look at the map, the more I prefer (and like) the solid lines. i agree too, you need the ferry lines on the map. most of the lines are smooth flowing except two. just above olympic park & directly beneath the "A" in balmoral. perhaps lower the angle the line leaves the opera house so it doesn't jerk so much when you take it around the word balmoral. also don't be afraid to give the manly end a bit of a curve too as the line there seems to cross the western tip of north head. in reality in comes out of manly cove on the other side as i think there is a wharf there. in the legend for the ferry attack routes you indicate the routes with < > attack both ways. they all have that symbol, they all attack both ways. so why not just say all ferry routes attack both ways. do you think some players might confuse the line showing where kensington is as a ferry route ? greenoaks wrote: i agree too, you need the ferry lines on the map. Uh huh! hear you on that. i'll see what i can improve. yes there is that possibility, so i think it might be prudent to change the line to something. see what i can come up with. ferry routes... hmm... clearly they are necessary for gameplay, because otherwise you have a northern region with one border. I also agree that the solid lines are better than the dotted line, as it looks more like a transit map of the city this way. I still don't think it would hurt to have some kind of Ferry logo on the territories with ferry terminals, as it would aid identification as well as lend itself to the transit map theme. It's still a little weird to me that you have bridges across waterways that aren't a part of gameplay. I look at the map and instantly think Attack Route! but then I do a double take every time. oaktown wrote: ferry routes... hmm... clearly they are necessary for gameplay, because otherwise you have a northern region with one border. I also agree that the solid lines are better than the dotted line, as it looks more like a transit map of the city this way. I still don't think it would hurt to have some kind of Ferry logo on the territories with ferry terminals, as it would aid identification as well as lend itself to the transit map theme. as far as a ferry logo goes....i would like to use one, but am reluctant as those terts would be sooooooo crowded if i put something else on them. see what others have to say about this...if they read this thread?! bridges are used on the freeway and freeways are impassable.....the roads were part of the attack routes in the previous version of this for the olympics and people didn't understand using them, so it got chopped. this simply uses roads as an impassable. and keeps gameplay simply and classic in style. It seems weird that the roads are impassable. Just seems a bit counter-intuitive. Nothing you can do about it though, I suppose. mibi wrote: It seems weird that the roads are impassable. Just seems a bit counter-intuitive. Nothing you can do about it though, I suppose. Of course mibi....yes there would be something i could do about it but don't wish to change this theme. Re: Sydney Metro V17 (P7) [I] - Ferries???? 3. added oaktown's suggestions of a ferry symbol, but i think those have to be cleared a bit better. 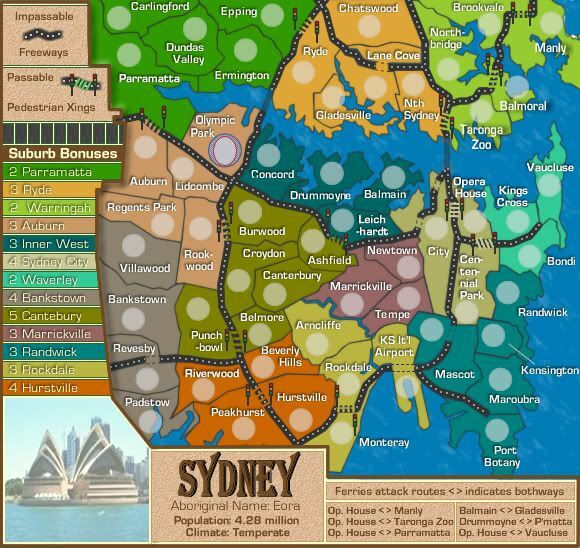 Re: Sydney Metro V17 (P7) [I] - Ferry Routes? That looks much better, more understandable, and less cramped. Good change there cairns.